Compressed air is heated air-and when you combine an aggressive fuel curve with elevated boost levels, high inlet temperature can result. That's why BD developed the Cool-It intercooler. 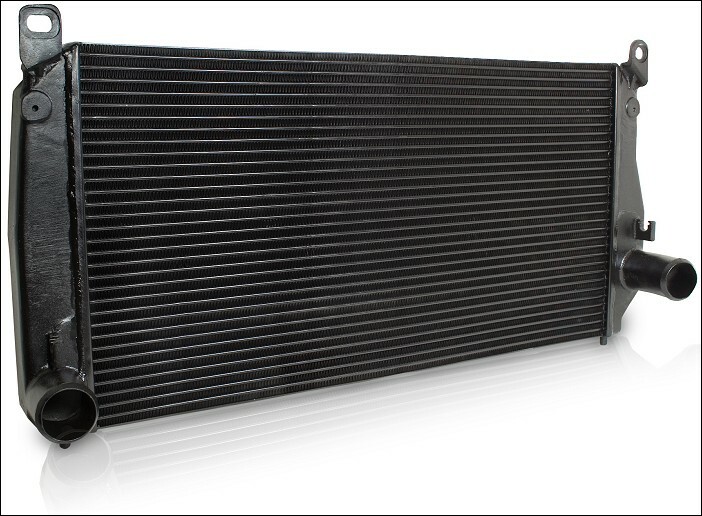 With up to 57% more cooling surface area and an up to 33% thicker core, the Cool-It increases cooling effectiveness to approximately 90%, compared to only 70% for the stock intercooler. That can mean a temperature reduction of up to 200 degrees Fahrenheit over the stock intercooler! At the same time, the up to 36% larger inlet and discharge tubes can handle up to 100 psi of boost and over 1500 cfm, while holding pressure drop to less than 1 psi. And with BD's new Chevy LB7/LLY Duramax unit having over 780 sq in of frontal cooling area and almost 2000 cu in. of cooling volume, that's an increase of 12% more area and 79% more volume over stock - 4% more area and 37% more volume over some competitors. A direct, bolt-in replacement for the stock unit, the Cool-It is the best-looking, best performing intercooler on the market. Hoses and spring loaded T-bar clamps included in some kits. New manufacturing design makes all end tanks with exclusive cast-in one-piece internal support columns that increase tank stiffness and strength. Cooling Volume = 1998.1 cu in. Frontal Area = 750 sq in.